I saw this post on Pinterest that suggested 1cup of water, 1/4 cup of listerine, 1/4 cup of vinegar. I have my Homedics foot bath that heats/ massages and bubbles (It is ahhhh-mazing). The amount of liquid the post suggested barely fills my footbath up even a smidge. So I filled the warm water to where I wanted it and added a 1/4 of the way with vinegar and another 1/4 of the way with Listerine. I hope you like the remedy as much as I did! 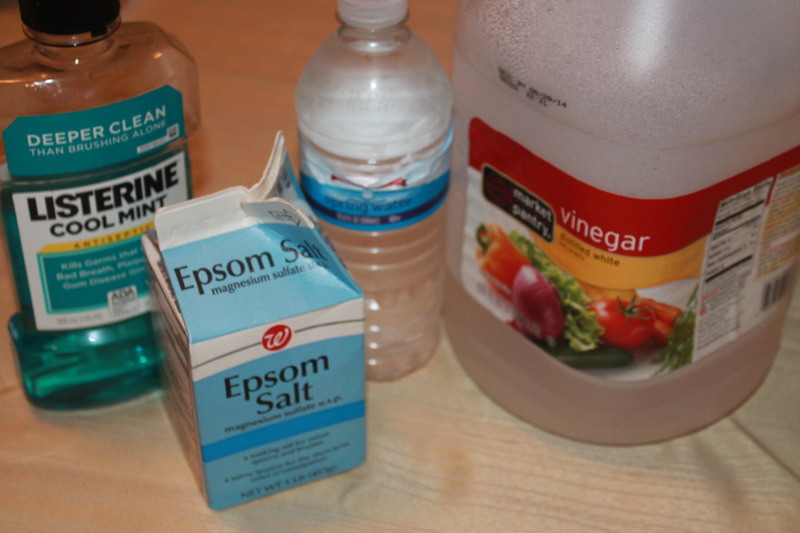 How much Epsom salts did you use? So would u say fill the foot bath half them add one cup of each n 2 cups of Epsom salt?